The new recital hall will be located in the central corridor, between the Middle School and Luck Leadership Center. Using this site required addressing the unattractive junior lot as well as the dangerous, two-block stretch of Fergusson Road. 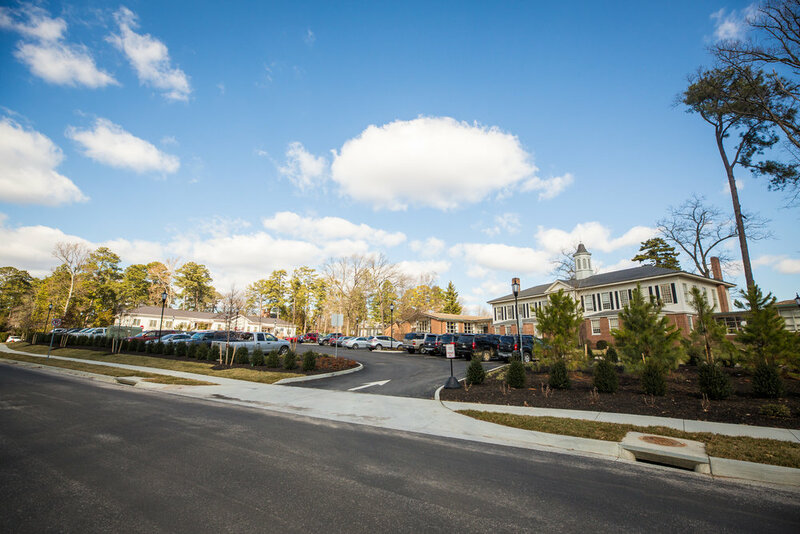 Working with the City of Richmond, we were able to realign Fergusson Road at its intersection with Henri Road and create a new entrance that provides a safe and handsome campus gateway. The design almost doubles the length of the Middle School carpool lane (moving carpool traffic off of public thoroughfares and closer to campus buildings) and creates a paved parking lot closer to the Middle School. New landscaping by renowned landscape architectural firm Waterstreet Studio features a combination of blooming trees and bushes as well as evergreens that will enhance the appearance of the south entrance to the School.